We had a reservation for 5pm on a weeknight so the restaurant was fairly quiet when we arrived with a few groups of friends, however when we left at around 6.30pm it was getting busy so I would recommend booking a table online to save any waiting around when you arrive. We were quickly shown to a table with a great view of Greys Monument and Grey street below, being on the third floor and having floor to ceiling windows meant this was one of the best views of Newcastle. 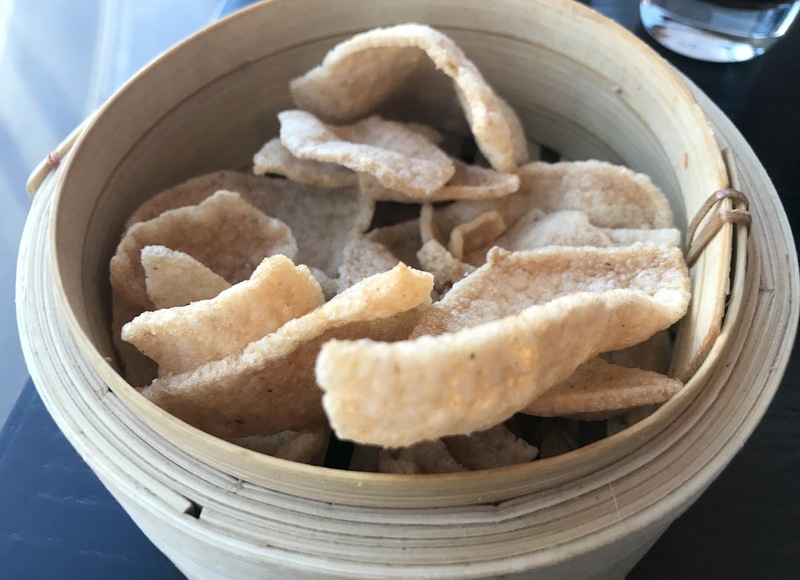 Great for people watching with a drink and complimentary prawn crackers whilst pursuing the menu. 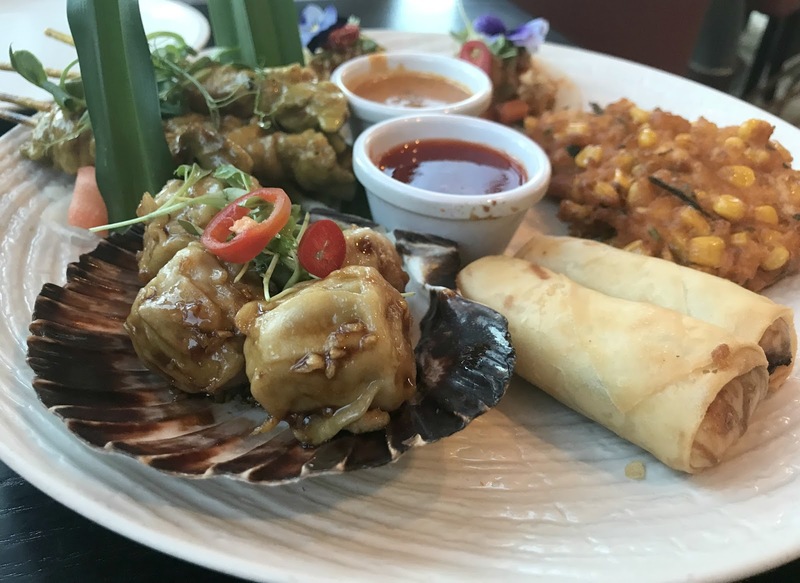 As the other half had never visited Chaophraya before our server recommended the Maeklong platter, which is a sharing platter (£9.50pp) and I am so glad they did as it give us a real variety of Thai dishes. 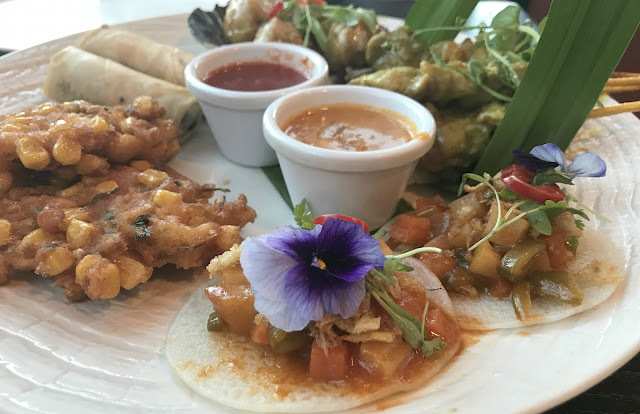 The Maeklong platter comes wonderfully presented and consisted of four chicken satay skewers, four pork dumplings, two chicken spring rolls, two sweetcorn cakes, two Thai vegetable tacos and two dipping sauces. The chicken satay was so tender, the spring rolls were really crispy and the pork dumplings were utterly delicious. The Thai vegetable tacos were so beautifully presented with dainty edible flowers and were almost too pretty to eat. We found service to be really friendly and all the staff were really discreet, no interrupting you when you are eating - we all know there is nothing worse then being asked if food is ok when you have just taken a bite of food! 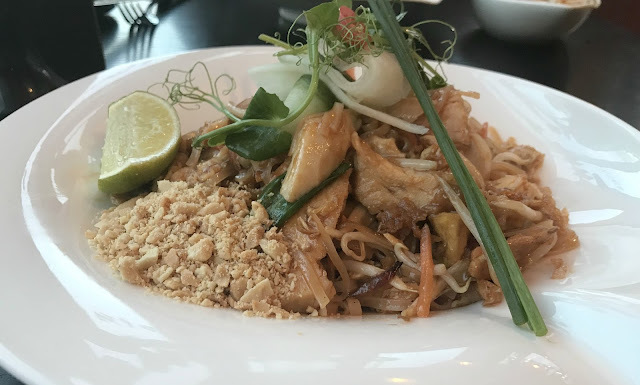 Onto mains and I ordered Chicken Pad Thai (£10.50) which is my absolute favourite and the Chaophraya version was most definitely the nicest one I have tasted so far. It is not hard to see why it is the national dish of Thailand. Stir-fried rice noodles in tamarind sauce with chicken, tofu, spring onions, carrots, eggs, sweet turnip (they taste so much nicer then they sound, trust me), bean sprouts and topped with pickled vegetables. This dish was full of strips of delicious tender chicken breast and was so filling that I could not finish it all. The other half spent ages deciding what he wanted before finally settling on Chicken with Cashew nuts (£12) and I have to say he choose well as it was extremely scrummy. 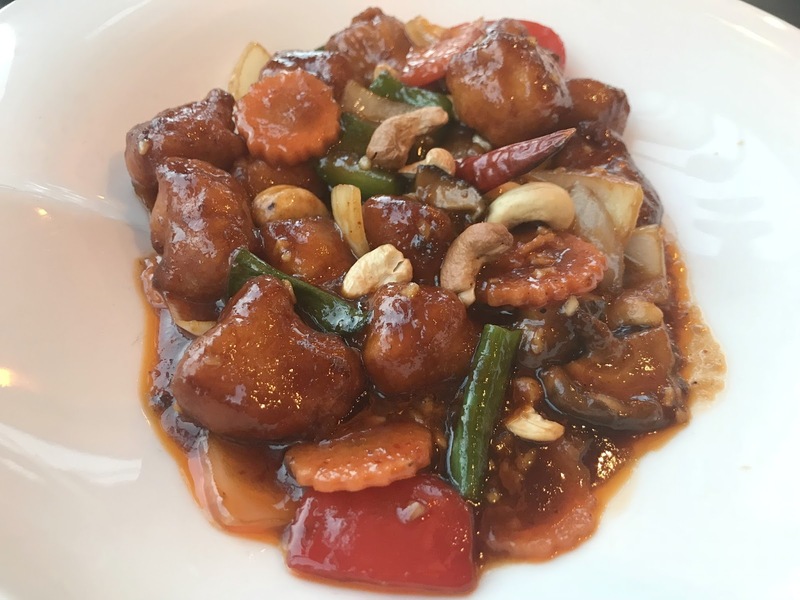 Stir-fried crispy chicken with cashew nuts, onions, peppers, mushrooms, spring onions served in a roasted red chilli sauce and topped with a roasted red chilli for added heat. It was really tasty and I will certainly be ordering this myself the next time I visit. You do need to order a side with this dish, I imagine it would be proper lush with one of rice dishes, however, the other half ordered himself a side of steamed noddles (£3.50) which wasn't quite the same. 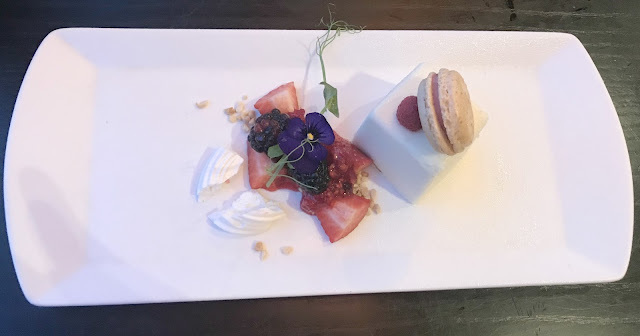 I was so full from my Pad Thai I was not planning on dessert, that was until I seen the dessert menu and I just had to order the White Chocolate Box (£7.50) and I am so glad I did. 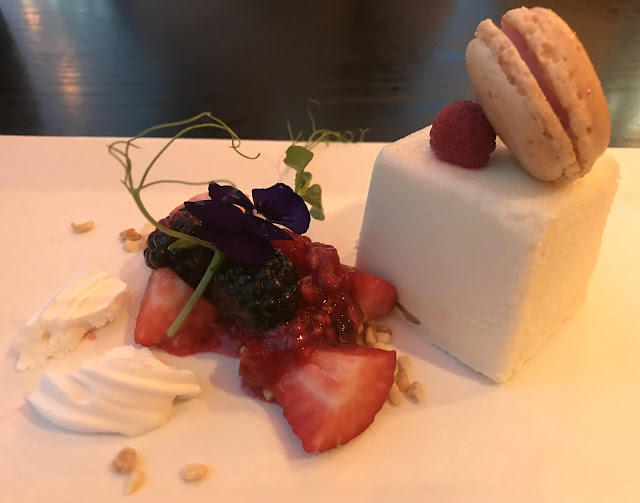 A white chocolate mousse with a raspberry coulis centre and shortbread base and shaped like a box, topped with a mini macaroon and passionfruit syrup and a side of fresh berries. It was the nicest dessert I have had in a long time. The total bill came to just over £60 for three courses for two and three soft drinks, which I think is good value for such a lovely meal. They also have a lunch menu available on weekdays between 12-5pm which is brilliant value with three courses just £17.95 and is perfect for a lunchtime catch up with friends or lunch whilst out shopping in the city. We really enjoyed our date night at Chaophraya, the staff were so lovely especially our server although I didn't catch her name. Every dish we tried was delicious and wonderfully presented and the setting is beautiful, the restaurant is cosy with low music, a nice atmosphere and amazing views of the city below. 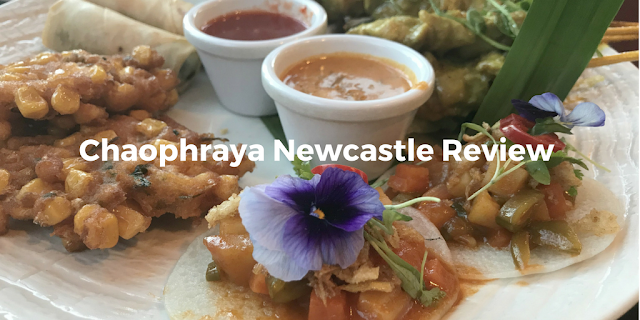 If you are looking for somewhere to head for date night in Newcastle then I really do recommend Chaophraya. Disclosure We received a complimentary meal for the purpose of this review, however, all opinions are my own. I LOVE LOVE LOVE Thai food - and pad thai is one of my favourites. This restaurant looks lovely - think I will need to visit if I'm ever in Newcastle! Ooooh I love Thai food and the chicken pad thai looks and sounds really good - yum! Loving your food choices. We are heading here on Saturday and now I can’t wait! I love Thai food and really miss it. We've no Thai restaurants near us in Portugal. Hubby and I always get a sharing platter for starters as it gives you a variety of tastes. And that dessert looks amazing. Good value in my opinion too! I have not had Thai food in the longest time but this looks absolutely yummy, loving the desserts too, looks incredibly tasty. I've not had Thai food in ages it all looks delicious also sounds like a lovely restaurant. Good to have a child free evening. The food looks yummy. Love Thai food. I’ve got food envy right now! All looks so delicious.